Like their own secret garden, this lush planter basket is the perfect escape for anyone who enjoys the natural beauty of living plants. 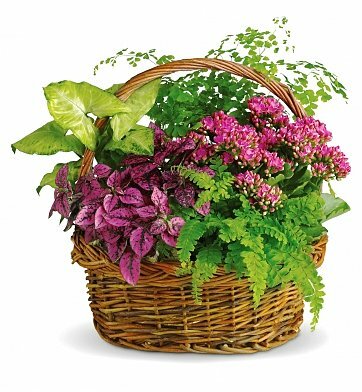 Fresh plants such as kalanchoe, hypoestes, nephthytis, and ferns are delivered fresh in a delightful wicker basket. Easy to care for and a charming sight to see, this basket promises long-lasting enjoyment. Arrives in a beautiful wicker basket. Measures approximately 15" x 15". During checkout, please be sure to indicate your preferred occasion when you choose a gift card. Exact plants and basket may vary depending upon location and availability. Secret Garden Basket is a hand delivered gift. These gifts are delivered by one of our local design centers located throughout the United States and Canada. Same day delivery is available for most gifts when ordered before the cutoff time. The cutoff time for Secret Garden Basket is 2 PM in the recipient's time zone. Most Beautiful Flowers I Have Ever Received In My Life! These were the exact words from the woman who received the Secret Garden Basket. She described the flowers in great detail and was absolutely thrilled! The basket was a perfect housewarming gift. Everything was fresh and lovely and they were able to delivery it so quickly! They definitely made me look like a hero! Recipient was very happy to have growing living plants. She was able to place them around her home when she returned. The flower basket was delivered and appreciated. Although it did not seem as full as this picture, it was very close and beautiful. I am sure if my friend with the green thumb cares for it, it will fill out. Thank you.